Students fled from Bouton Hall on Sept. 24, when the fire alarm sent them barefoot and anxious outdoors, due to a sudden gas detection. The natural gas leak is speculated to have occurred due to a mechanical issue in a boiler located in the basement sprinkler room. The New Paltz Fire Department was dispatched at 6:44 p.m., following a gas odor report outside the Wooster Science building. However, Cory Wirthmann, New Paltz fire chief, did not discover gas in this location and detected the leak once searching Bouton Hall. “As I got to the north side of Bouton, I mean, it hit you like a ton of bricks, and it was just a very, very strong odor of gas, which we instantly determined was natural gas,” Wirthmann said. The fire alarm was signaled at roughly 7:15 p.m., in order to immediately evacuate everyone from the building. The fire department then performed a ventilation process to rid of the gas and shut off the gas line, before experts from Central Hudson (CH) Gas & Electric arrived to the scene. “Upon arrival, we checked the building for any signs of gas and found none, and this confirmed that there was no additional source,” said John Maserjian, media relations director of CH. “It appeared not to be a leak in the gas system, but rather a problem with one of the appliances,” he said. 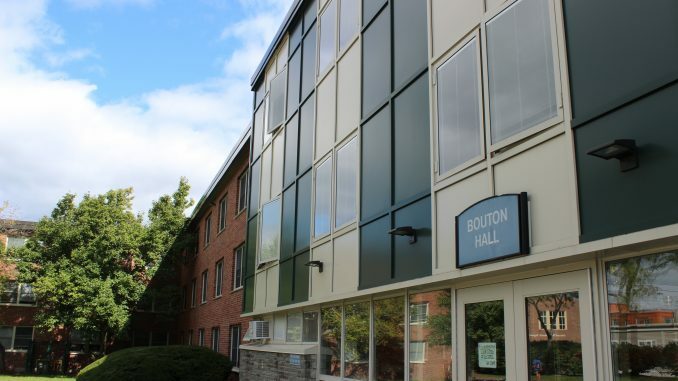 Katie Rossano, Complex Director of Bouton Hall, issued an email to residents at 8 p.m. to inform and advise them to remain in surrounding areas, such the Student Union Building, Sojourner Truth Library and the main lounge of Capen, where the residence staff waited for updates themselves. Residents were instructed to remain at least 100 feet away from the building, until Rossano issued another email that they were cleared to re-enter and resume their nights at 8:47 p.m. Immediately following the incident, students were panicked and concerned regarding their sleeping situations for the night. They reported that they had smelled gas for about a week prior to this incident, but the leak was detected on the night students were evacuated. “I am disappointed in the system in Bouton. I think this alarm should have gone off a week ago, actually, and they put all of our health at risk,” said first-year student Charlotte Vignoles. High temperature and hot water are currently feeding the building, as the gas line remains off. Further inspections of the backup hot water supply are still being conducted, and the Facilities Operations staff are working to find the source of the issue, according to Schulte.